The rise of the fast-casual restaurant, including the new Westside Atlanta location of Bell Street Burritos, owes a great deal to the burrito. This Tex-Mex tradition is perhaps the burger of that fused cuisine. Like the burger, the burrito is generally a massively hulking inclusion of typical toppings. But as the trend to produce these wrapped time-bombs of gastrointestinal danger has risen, so too has the diversity of their staple composition. The Atlanta restaurant space is now ripe with burrito shops. We’ve got the big boys like Chipotle, Willy’s, and Moe’s. Then there are single location operations like Decatur’s hot spot of love, Raging Burrito [REVIEW INTERLUDE: Speaking of Raging Burrito: Blow up the receipt at the right and then check out this post, which never got a lot of attention. Now back to our fair city and the series of burrito purveyors found within]. While these restaurants are a dime a dozen, and their food is often indistinguishable from the competition’s, Bell Street owner Matt Hinton has set out to differentiate Bell Street. With the opening of his second location, it appears he’s well on his way to that goal. A few decades back, burrito culture was relegated to places like the now defunct Rio Bravo. Like many “Mexican restaurants” from recent past, these establishments took the centuries’ old practice of taking an ingredient or two, coiling it up in a tortilla, and presenting it to an anxiously waiting Gringo. In the late 80’s, a dedicated burrito shop named Tortillas flexed its muscle down on Ponce De Leon Ave … and for the next 15 or so years, Atlanta had it’s first dedicated San Francisco burrito shop. When the big box chains started rolling in, Tortillas started rolling out. It closed in the early 00’s. So fast forward a few years later, when educational enthusiast Matt Hinton decided to raise Tortillas from the dead by way of a rogue delivery service. He named his venture West End Burritos, and his stuff became so popular that he eventually moved into the revitalized Sweet Auburn Curb Market in Downtown. After a much publicized search for a supplemental location, Hinton finally scored a lease at 1663 Howell Mill Rd, the former home of the Social House breakfast joint. After a few months of delay, Bell Street Burritos finally got its very own home just this past week. Bell Street’s newest location is a mere extension of their original spot in Sweet Auburn. They’ve maintained the familiar tile backed wall and logo and supplemented it with several antique accents, the coolest being one of the old cloth bus signs (you know that rolled up to show you what stop was next) as well as a gigantic ceiling fan that I’m told is functional. It’s not loud, it’s not obnoxious, it’s just kinda quiet and cool – indicative of the personable and neighborhood approach Bell Street seems known for. The dining arena itself is filled with wood tables, a few booths, and a touch of antique inspiration from Hinton’s past. Out back, they’re working on a patio so that customers can order to-go inside, but still stay on site. With the ability to manage their own schedule in the absence of external interference, Bell Street has gone from a lunch only spot to a full fledged lunch and dinner option. They’re open from 11am Monday-Saturday and out of there at 9pm (save for Fr/Sa when it’s 10pm). The help round out the experience, the menu now includes quesadillas, tacos, nachos, some sides, a few sweets, and drinks. While burgers, hot dogs, and a slew of other American classics have really started to go “off the reservation” in their executions, burritos are still relatively tamed. Bell Street Burritos basically adheres to this ideology throughout its menu where items are simply reformations of a simple list of proteins. You essentially pick your protein and have BSB insert it into your desired tortilla. In the case of the burritos and quesadillas, these would be 12” flour tortillas courtesy of Los Amigos Tortilla company. They use someone else for their corn tortillas, but I forget which. Anyway, quesadillas include jack cheese, salsa fresca and the meat, shrimp, or veggie that you select. They start at just shy of $4 and go up to $5.75. Comparatively, the burritos – the monstrous mo’fos that they are – add rice and pinto beans to that cheese and salsa fresca tortilla mix. They run just shy of $5 up to $6.75 – essentially $1 more than their quesadilla counter parts. BSB now offers tacos (in the way of soft corn tortillas) for between $2-$3, including a green and chipotle option. Not to be forgotten, the drink menu is appealing. Included are Jaritos, Mexican coke in a glass, as well as fountain drinks – including my much beloved Cheerwine (a cherry coke/dr. pepper sort of concoction) that I usually only see in the bottle. It’s a nice little menu that should put you out no more than $8-$12 per sitting. When I showed up with buddy in tow, we each took down a big burrito. My partner in meal went with a green chili taco and a pork burrito ($6.50) affixed with the green sauce (defined as hotter), cilantro, jalapeños, and onions. Those are all free additions – you can adjust your burrito with any number of additions such as extra proteins, cheese dip, etc. and you can have them grill it for an additional $.50. I did the shrimp rendition ($6.75) with some free stuff inside, including the chipotle salsa (described as hot). I did slam dance with a bite of his green chili taco, which I found to be a solid bite, but nothing to yell at the top of my lungs about. It seemed as its powerful Mexican origins were restrained … perhaps to appeal to a wider spectrum of Americanos. 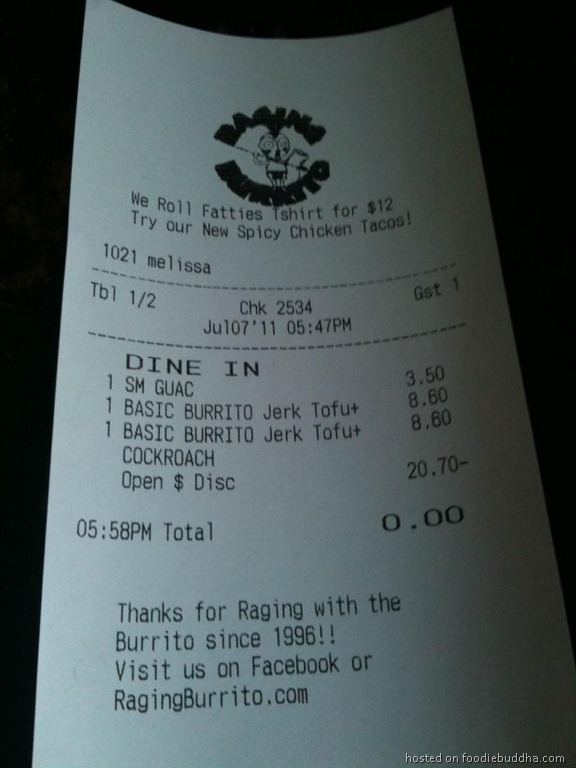 Meanwhile, my burrito came just as expected. It was a colossal endeavor well worth the price tag. Though the innards constituted a slew of sauces (juice from the beans and the salsa) everything settled nicely. As burritos are usually consumed with two fists and a face down near your plate – the flavors are usually more pronounced as you move down the line … where everything has collected at the bottom. This was certainly the case as the heat from the hottest of their salsas, though never approaching my quest for real spice, was most noticeable by the end. Of no surprise to those of us that have had BSB before, these are relatively clean eats. Though they are absolutely packed out tortillas filled with a slew of items one would expect to end up on a nearby shirt, things held together with my shrimp burrito, just as they had down at the original spot. But as for the specifics, my shrimp was nicely cooked, the rice and beans were spot on al dente. I think my one true criticism is that I felt the inner most portion of the burrito wasn’t particularly warm. Bell Street’s burritos are straight up comfort. I never look to them to provide me with those moments of exuberance whereby I close my eyes and let the world around me stop. I look to Hinton’s Bell Street to provide comfortable food that’s easy to afford and pleasant to eat. If you absolutely love these things, I’d be far less inclined to call you crazy than if you hate them. I don’t see Bell Street ever producing a life changing bite, and that’s just fine. Sometimes we just need a little smooth sailing in our lives.